The HilverZorg Foundation is an organization for geriatric care and mental health care for elderly people. The HilverZorg Foundation includes seven locations. 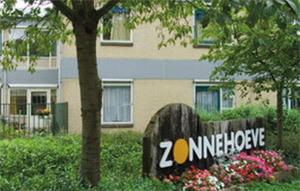 Zonnehoeve is a nursing home for accommodation, treatment and support of people with a psychogeriatric disorder (dementia), people with non-congenital brain damage and young demented people. In all there are 150 permanent residents and 45 outpatients. Because of the character of the facilities and the location of the Zonnestraal country estate in the beautiful forest of Loosdrecht, it is necessary that the provision of keys is done in a good, reliable and safe way. It is of vital importance that the current access procedures, at which distinction is made between residents and nursing staff, are supplied by computerized key management. Zonnehoeve wishes to distribute the 500 issued keys from one point. Everyone used to take the key home. For security reasons this proved to be inconvenient. The organization then started looking for an alternative for the distribution of keys with registration which could serve as a basis for tightening the procedures. The key management system KeyWatcher® met the set criteria and wishes. In addition, the KeyWatcher® had already proven its functionality and reliability with its use in other departments of the organization. Because allocated keys are only released to users with the appropriate authorization, the KeyWatcher® helps to pursue a certain policy and to ensure that procedures are followed. On a minimum-sized wall surface the ergonomically executed system eliminates old-fashioned key cabinets, unreliable handmade journals and sloppy ID tags. It files the history of each key including the user, date and time of distribution and return of the key. The solidly executed stainless steel cabinet has been designed to prevent abuse and it is manipulation-proof. By using the KeyPro™ Performance Software you can manage, if you are authorized, one or more KeyWatcher® systems through the network of any work station within your organization. You are able to change the data in your database, retrieve reports, release keys, cancel alarms etc. This way, the opportunity is created to manage and check the access to buildings and rooms, subject to time and place, 24/7. After opting for the KeyWatcher® key management system, Zonnehoeve decided to install the system at a central point which is only accessible by staff. The Key Watcher manages the access to the keys and the keys can be tracked when they are in use, including the times and user names. The personnel are authorized different levels of access to the smart keys with keys. This way, efficient control is managed and carelessness or inadvertences will be prevented. By means of the KeyPro™ Performance Software the KeyWatcher® systems are managed at a distance both centrally and locally through a modem connection and the transactions and reports are filed. Thanks to the use of the KeyWatcher® key management system of Morse Watchmans and the KeyPro™ Performance Software, Zonnehoeve has been able to create a stricter key policy and to tighten the procedures concerning management and reporting. The possibility of time-saving and single use for example by temporary workers, have also been of importance in successfully deploying the system.